In plant cells, the cytoskeleton comprises distinct and highly dynamic arrays of microtubules and actin microfilaments. The basic structures and proteins of both the microtubules (∼25 nm-diameter polymers of α- and β-tubulin heterodimers), and the microfilaments (∼7 nm-diameter polymers of 42 kDa actin monomers) are conserved in all eukaryotic organisms, and occur in all cell types. The third cytoskeletal array present in animal cells, intermediate filaments, are of a more varied composition and their presence has not (yet) been demonstrated in plant cells. The basic organization of microtubules and microfilaments in various plant cells was determined over several decades from static images of fixed material. These images often demonstrated that microfilaments co-align with microtubules. 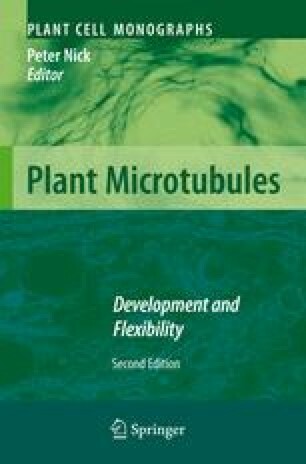 As functional and molecular studies have become more prevalent, it has become apparent that co-ordination of dynamic microtubules and microfilaments is necessary for many facets of growth and development, and that cross-talk exists between them. Numerous studies have shown such interactions in animal cells (Gavin 1997; Goode et al. 2000; Dehmelt and Halpain 2003), and it is the diversity of these processes in plants that forms the subject of this review. As such, this review takes a broad approach to the topic. Defining microtubule–microfilament cross-talk (or microfilament–microtubule cross-talk for those of an actin persuasion) as any type of relationship between microtubules and microfilaments, the review commences with a reassessment of early work into colocalization between microtubules and microfilaments (Sect. ?? ), which leads to information about microtubule–microfilament interactions (Sect. ??). In this review, the term “interactions” implies a direct, physical relationship between the two components of the cytoskeleton, whereas “cross-talk” is used in a more encompassing way that includes indirect interactions. Section ? ?considers proteins that might mediate direct microtubule–microfilament interactions. However, taking the broad view of microtubule–microfilament cross-talk leads to discussion of systems where both microtubules and microfilaments play a role, but without any direct involvement with one another. Such microtubule–microfilament co-ordination seemingly occurs in organelle movement and shaping (Sect. ??). A further component of microtubule–microfilament cross-talk involves indirect, but specific interplay between the networks via the Rop-signalling pathway (Sect. ??). The cytoskeleton performs numerous fundamental roles within plant cells, and plant biologists have demonstrated that the microtubules and microfilaments function independently in many of these. However, as this review documents, on the occasions when these two networks come together, and there is interplay between them, dissecting the tangled cross-wires of the microtubules and microfilaments can become difficult.